“I think my child might have _______________ (insert any learning disability) but I don’t want him to be labeled”. If I had a dollar for every time I’ve heard that statement, I would never have to worry about running out of money! I’ve had so many conversations either in person or online with parents about having their child evaluated for learning disabilities. I’m talking about the a learning disability like dyslexia, ADD, ADHD, and autism to name a few. Over and over again I hear the fear of their child being “labeled”. I get it, you don’t want your child to be singled out. No one wants our child to be treated any different than their peers. That being said, I cringe a little inside when I hear this. My argument to these parents is this: It’s not a label, it’s a diagnosis. Knowing will help your child, not hurt them. I get the fear of labeling your child, I really do. I was there too. Our son has been diagnosed with Autism, Anxiety, Dyslexia, and ADHD. His first diagnosis came just before his 8th birthday. It took me a while to actually admit we needed to have him evaluated for a learning disability. As parents, we never want our child to be different. If they receive a diagnosis of a learning disability, we fear they will be considered different. There is the fear of the unknown, and worst of all we fear the dreaded “label”. No one wants their child to be labeled with a learning disability for the rest of their life. It is perfectly normal to not want your child to be labeled, so I get it. There’s nothing wrong with that. That is until the fear of the label becomes the problem. The reality is, whether or not you have your child tested for a learning disability you suspect they have, it doesn’t change the fact that your child is dealing with this. If you are choosing not to test because you fear the “label”, you might really be doing more harm than good. Now I’m not trying to pass judgement or make you feel guilty for not testing, but please hear me out. Let’s assume you suspect your child has a learning disability. If you choose not to have them evaluated, you’ll never get an official diagnosis. Without the diagnosis it’s really difficult to help your child work through this and adapt to their needs. On top of the reasons just mentioned, chances are your child may know there is something different about them. Avoiding a diagnosis might communicate to your child that there is something wrong, or bad about them. Without realizing it, our intent to protect them from the diagnosis can actually make them feel shame. Living in a state of denial about our child’s learning disability may cause them to feel like they need to hide and be ashamed about who they really are. As homeschoolers, it’s easy to think we don’t need to have our children evaluated. After all, the beauty of homeschooling is having an education environment tailored to your child. This is a true statement; but, going by trial and error because you suspect your child has a learning disability can lead to a lot of frustration. Frustration for both you and your child. Trust me, I’ve been there. The thing about all the various learning disabilities is that many of them have overlapping symptoms. They can be very complicated, and I don’t recommend you “self diagnose”. Without accurate information of how your child’s brain is processing information, you might find yourself trying numerous different techniques that are not suitable for your child. This will only add to the frustration. Not to mention, when you do a lot of trial and error it will cost you in time, money, and headaches. One of the best things about homeschooling, is that if your child does have a learning disability, nobody else needs to know! Did you catch that? Your child doesn’t need to be “labeled” because they’re not being pulled from the classroom. 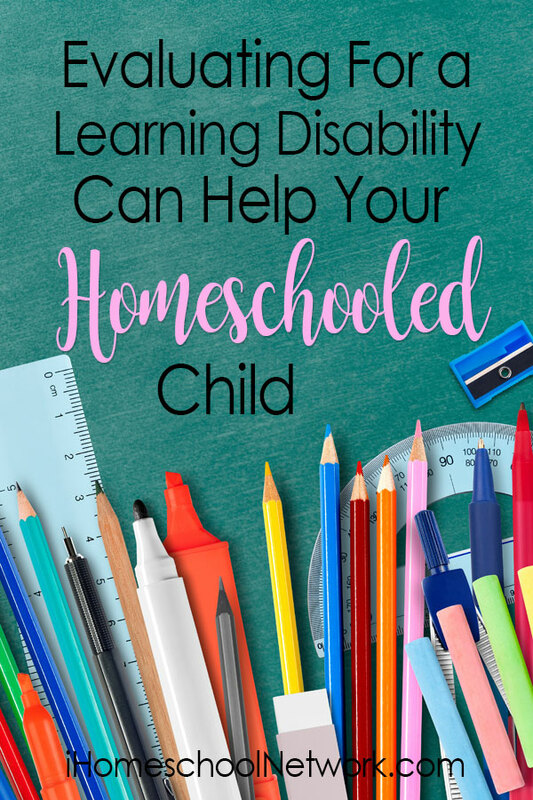 When you have your child evaluated for learning disabilities as a homeschooler, it means you can get the answers without having them labeled in the classroom! One of the main reasons we decided to have our son evaluated was because of behavior challenges we were having. Like many homeschool moms I decided to just teach him how he learns and go at his pace without going through evaluations. That was before I did more research on the different learning disabilities we suspected. Through the research, I learned these diagnoses can come with a whole laundry list of emotional/behavioral things to consider. Our son was exhibiting some pretty extreme behavior and emotional problems. We tried every parenting trick, but none were successful. I was on my last nerve. The time for answers had come. It was time to know for certain if our son’s emotional and behavioral problems were a result of a learning disability causing his brain to function differently. If we knew the diagnosis, we would know how to parent him, and the root cause of his behaviors. Then, and only then, will we be able to help him effectively. If you suspect your child has a learning disability, I ask you to seriously consider having them evaluated it if you suspect something. Please, for the sake of your children don’t refuse an evaluation because you fear the label that can come with it. Our children deserve the best chance to succeed in life. A diagnosis can help them have this chance. It’s not something to fear. After all, whether or not you decide to test and get the diagnosis, your child may be living with their condition. If they are, I would guess, they are struggling. Avoiding the diagnosis doesn’t change the fact that your child may have a learning disability. Another thing to consider is that it’s a real possibility that your child could benefit from occupational or speech therapy. Without the diagnosis you really just don’t know. Plus, you will probably need a diagnosis for insurance to pay for these services your child needs. Before I finish the post, I want to encourage you. After receiving a diagnosis, there is hope. You will find hope in understanding your child, and finding effective ways to teach/parent them. There is hope that comes with seeing your child make progress. Hope of finding techniques designed for your child’s learning disability that helps them be successful. Many children with a learning disability grow up to be world changers. Because they think differently, they can see things differently. They can dream, create, and problem solve in ways others can’t. Did you know Walt Disney was dyslexic? Homeschooling a child with special needs means we have a different kind of normal! I love being able to share with the ins and outs of raising and homeschooling special needs kids with those in the trenches with me. Thanks so much for this! I’m going through the process of figuring out what tests to get and what to do. Yes, symptoms can overlap…when I thought we might be looking to test him for one thing, digging in it looks like we might be testing him for several.